Today’s Star Wars Celebration panel for The Rise of Skywalker had lots of information to go around. You can catch up with it in our panel recap. 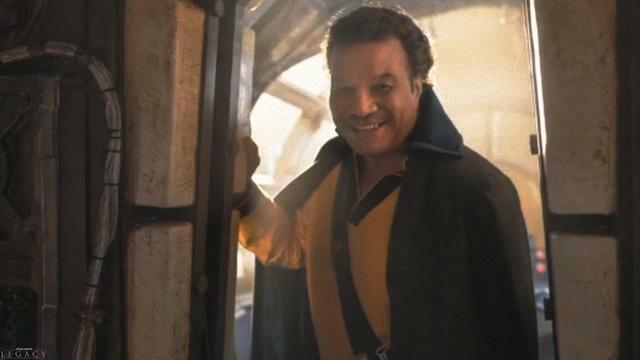 But one particular moment that stood out was the return of Billy Dee Williams as Lando Calrissian. Not only did we get a glimpse of the returning “scoundrel” in a new photo, but we also got to see him in the new trailer as well. And he had a few kind words for his character while speaking to host Stephen Colbert during the panel. It’s been a good while since we’ve seen Williams as Lando in the Star Wars universe. His last appearance on-screen was in Return of the Jedi back in 1983. However, during that time, we’ve seen recurring appearances by the character. For example, Williams voiced Lando on Star Wars Rebels during guest appearances. However, many fans will feel this is a true return for the character, and they can’t wait to see what he has in store. Especially when he pilots the Millennium Falcon again. Star Wars: The Rise of Skywalker releases in theaters on December 20. Are you happy to see Lando back in action? Let us know in the comments below!